CA-Top Secret and the OS/390 Security Server are both sophisticated products. In some areas their designs are similar, and in other areas the designs are very different. 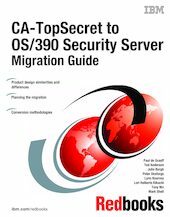 Planning a migration from CA-Top Secret to the RACF element of the OS/390 Security Server, without unduly disrupting an OS/390 production environment, requires considerable planning and understanding. With proper planning, and perhaps with specially skilled people to assist in certain areas, the migration can usually be accomplished in an orderly way. Understanding the higher-level issues and differences between the two products is an important starting point. This IBM Redbooks publication is intended to assist in this area.